What many people may not realize about being a writer is that it can be nerve wracking. We writers pour our hearts and souls into what we do, and if there is a single misspelled word we feel failure. It is not an easy job, but one that we all feel crazily compelled to do. We can be an insecure bunch of people, but we are not in it alone. The only thing I would do differently is to wrap my entire family in bubble wrap. Without going into detail, let me just say that seeing the inside of nine emergency rooms in twelve months is more than anyone should have to go through. (No one died this year, so there’s that). To say the least, this put a huge crimp on my writing progress. Getting a story out has been the last thing on my to-do list. It wasn’t all bad though. I did manage to complete a couple of short stories, several blog posts, and I wrote everyday for NaNoWriMo. My debut novel, The Manx, is shaping up with characters that are living and breathing entities in a brilliant world. I also attended two writing conferences (PPWC and RMFW) where I reconnected with writers across the country and re-energized my creative battery. 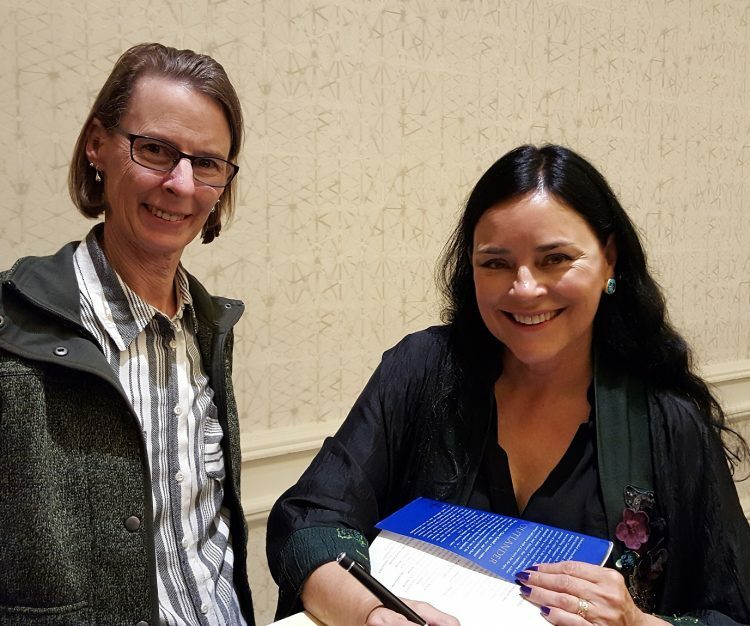 I also had the pleasure to meet one of my favorite authors, Diane Gabaldon. My advice to anyone who is in the thick of life’s challenges? Get through it anyway you can. Writing does not have to be at the top of your to-do list, but sometimes it should surface to the top just so you can have a few moments of sanity. It is okay to let the words fall by the side of the road while you are trying to maintain a straight direction with four flat tires. Say goodbye to 2017 because 2018 will be a better year. It has to be. Thanks to our awesome co-hosts for the December 6 posting of the IWSG, Julie Flanders, Shannon Lawrence, Fundy Blue, and Heather Gardner! Ah, the emergency room years. My daughter was a frequent flier when she was little, landing in the ER again and again. May 2018 bring you more peaceful time to write. I’m sorry to hear you had to experience that too! I’m glad it is over for you and your daughter. 2018 will be peaceful…bubble wrap is the key! Sorry to hear about those health issues and I sincerely hope that 2018 will be better for you. It’s good to know that you managed to get some writing done to bring you those moments of sanity and peace. Thank you Debbie. Every snippet of quiet is a blessing these days. I hope you get many of them in 2018 as well. 9 ER visits? Oh my. That can sure take a toll. I’m glad no one passed away and hope everyone is okay to date. Thanks ChrysFey. It was a tough haul, but I think we are seeing the light. I was happy to write everyday for NaNo and I’m looking forward to doing it again during 28 Days of Writing. We’ve got to keep moving forward. It’s the only way. You sound like you have a positive outlook! That’s a first step! Wow–that’s a lot of time in ER. I’m impressed that you got any writing done at all! Better luck with 2018. I was surprised myself that I got writing done. My critique group kept me inspired and celebrated anytime I submitted to them. They are my writing spot of sunshine. How Does My Garlic Grow?